The central barbecue area contains five high powered stainless steel burners each delivering 11,600 BTU's (3.4kW) - that's a massive total output of 55,000 BTU's (16.1kW). The flexible cooking area is a generous 76(w) x 43(d)cm and can be independently controlled from the elegant front control panel allowing the chef to spit roast, grill, boil, roast, fry, and even sizzle cook just about any food for almost any occasion. 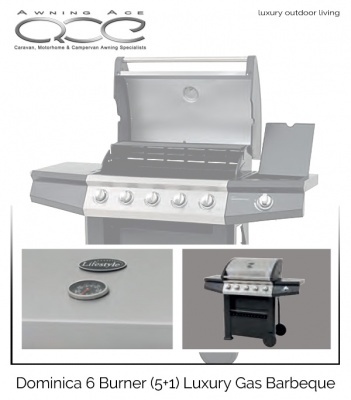 A spacious internal stainless steel warming rack with flame tamer allows for easy movement of cooked food or a superb area for smoking. 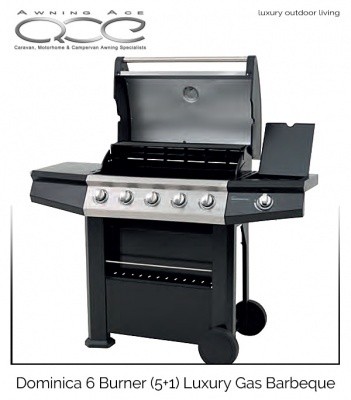 The double skinned barbecue roasting hood features an external temperature gauge and elegant full-width stainless steel handle. 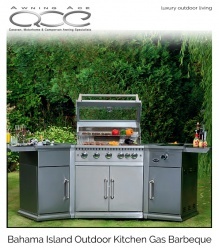 The right-hand shelved worksurface conceals a side burner measuring 26(w) x 29(d)cm and delivering 12,000 BTU's (3.5kW). 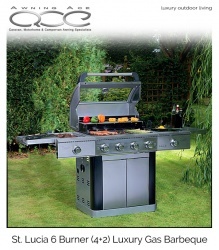 The burner can be independently controlled and the area can also be used as a food preparation surface. The left-hand shelf incorporates a sturdy handle so you can easily move the barbecue - this also doubles as a hanging rail for your cooking utensils or tea towel.